On October 18th, many South Campus students and families gathered to celebrate autumn and American History. The school was filled with the delicious smells of pumpkin pie, cornbread, roasted vegetables and more. This was the first of four such celebrations where students act out folktales, display art projects and share what they’ve learned in different units. Third and fourth grade drama students presented a creative interpretation of RAVEN, a Native American folktale, using masks, movement and music. Fifth grade boys shared a puppet show about the LOG CHIEF and a silly story called GOOD & BAD. These 5th grade boys also created many of the set pieces and props for both groups. 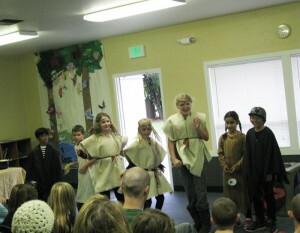 Several classes participated by sharing TALL TALES, COLONIAL GAMES and STATE REPORTS. It was a delightful afternoon of learning, sharing, food and friendship.